Keratosis follicularis spinulosa decalvans (KFSD) is a type of scarring alopecia which is grouped under a broader term keratosis pilaris atrophicans (KPAs). The other two clinical entities under KPAs include KPA faciei and atrophoderma. Common to these conditions are keratotic follicular papules, non-purulent inflammation of variable degree, irreversible hair loss, and/or atrophic depression similar to pitted scars. Very few cases of KFSD have been reported in Indian literature. ,, We here present a case report of severe form of KFSD, a rare cause of scarring alopecia in 2 young Indian girls. A 8-year-old female came to the clinic with complaints of hair loss over the scalp since 6 years with sparse eye brows. Hair loss was progressive in spite of trying Ayurvedic medicine and homeopathy. On examination hair density was reduced over the scalp with vellus and terminal hairs. 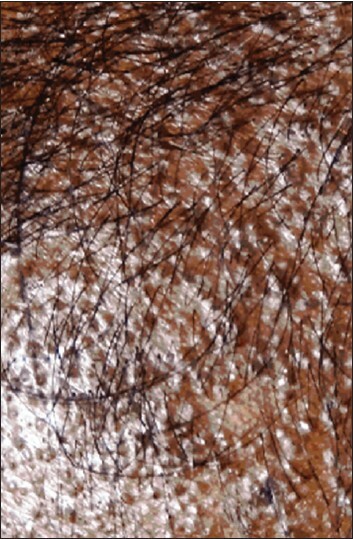 Multiple follicular papules were seen giving roughness to the scalp [Figure 1] and [Figure 2]. Similar lesions were seen all over the back, chest wall, extensor aspects of limbs. There was no history of photophobia and ophthalmic examination showed no evidence of conjunctival/corneal involvement. Punch biopsies were taken and submitted for histopathological examination. Her 5 year old sister had similar complaints. Both the siblings were normal at birth, the above symptoms started from the age of 2 years. However, biopsy was not taken from the younger sibling. 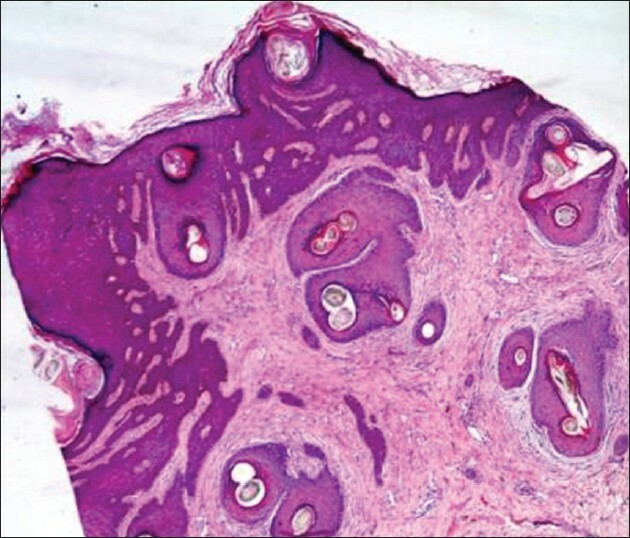 Histopathologic examination revealed hyperkeratosis and mild acanthosis of epidermis with follicular plugging and dilated infundibulum [Figure 3]. 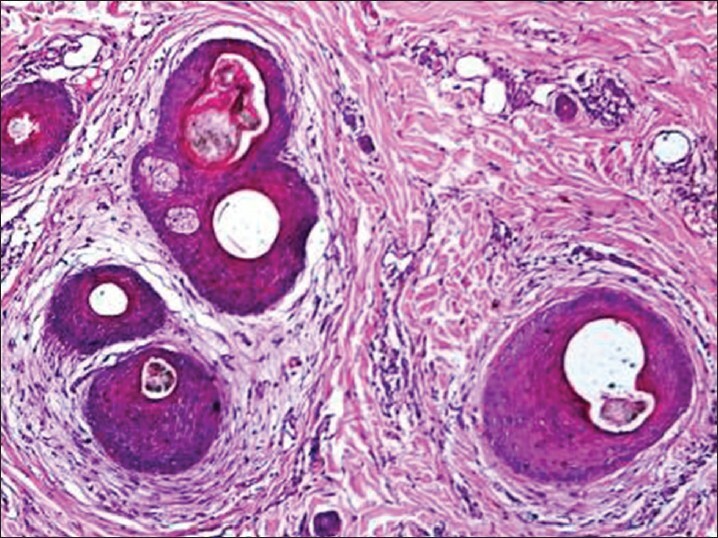 The dermis revealed perifollicular lymphocytic infiltrate with eccentric epithelial atrophy, polytrichia, and perifollicular fibrosis [Figure 4]. Periodicacid Schiffs (PAS) stain done did not show any fungal organisms. Considering family history and clinical features, a diagnosis of KFSD was offered. In X-linked dominant inheritance pattern, men present with full blown disease, whereas female act as carriers and have milder form of disease. Females with severe form of disease have also been reported. , These cases either had autosomal dominant pattern of inheritance and few cases were sporadic in onset. A theory of non-random X inactivation (process of lyonization) was proposed in cases with sporadic onset. In present case report, both the sisters were affected without any other family members being involved. They may either have autosomal dominant pattern of inheritance or process of lyonization. There is no specific treatment for KFSD. Various drugs have been tried to delay scarring alopecia such as isotretinoin and dapsone. , For symptomatic relief emollients, topical steroid, and keratolytic agents can be used. 1. Reddy BS, Thadeus J, Garg BR, Rathnakar C. Keratosis follicularis spinulosa decalvans. Indian J Dermatol Venereol Leprol 1995;61:106-8. 2. Puri N, Malhotra SK. Keratosis follicularis spinulosa decalvans: A rare entity. Egypt Dermatol Online J 2008;4:1-6. 3. Sequeira FF, Jayaseelan E. Keratosis follicularis spinulosa decalvans in a female. Indian J Dermatol Venereol Leprol 2011;77:325-7. 4. Sellheyer K, Bergfeld WF. Histopathologic evaluation of alopecias. Am J Dermatopathol 2006;28:236-59. 5. Porteous ME, Strain L, Logie LJ, Herd RM, Benton EC. Keratosis follicularis spinulosa decalvans: Confirmation of linkage to Xp22.13-p22.2. J Med Genet 1998;35:336-7. 6. Macleod JM. 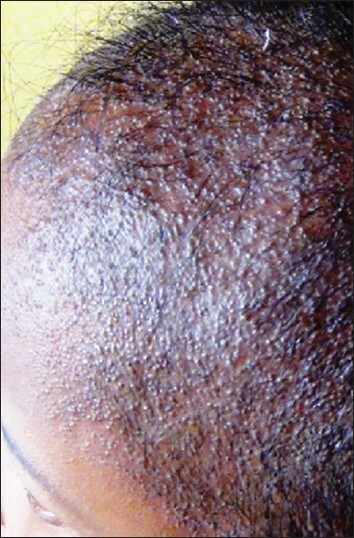 Three cases of ichthyosis follicularis associated with baldness. Br J Dermatol 1909;21:165-89. 7. Rand R, Baden HP. Keratosis follicularis spinulosa decalvans. Report of two cases and literature review. Arch Dermatol 1983;119:22-6. 8. Oosterwijk JC, Nelen M, van Zandvoort PM, van Osch LD, Oranje AP, Wittebol-Post D, et al. Linkage analysis of keratosis follicularis spinulosa decalvans, and regional assignment to human chromosome Xp21.2-p22.2. Am J Hum Genet 1992;50:801-7. 9. Ross EK, Tan E, Shapiro J. Update on primary cicatricial alopecias. J Am Acad Dermatol 2005;53:1-37. 10. Alfadley A, Al Hawsawi K, Hainau B, Al Aboud K. Two brothers with keratosis follicularis spinulosa decalvans. J Am Acad Dermatol 2002;47:S275-8. 11. Bellet JS, Kaplan AL, Selim MA, Olsen EA. Keratosis follicularis spinulosa decalvans in a family. J Am Acad Dermatol 2008;58:499-502.